Where is my aircraft now? Split into two main panels - Left Panel being the text description of the status of each aircraft, standard fields being Aircraft Registration, Last Position Report Time and Location (All of which are configurable, users can add in Callsign, Altitude, Speed, and many more to meet your personal requirements) The Right panel is the visual representation of the aircraft positions, this can be set to be displayed on various map sets. 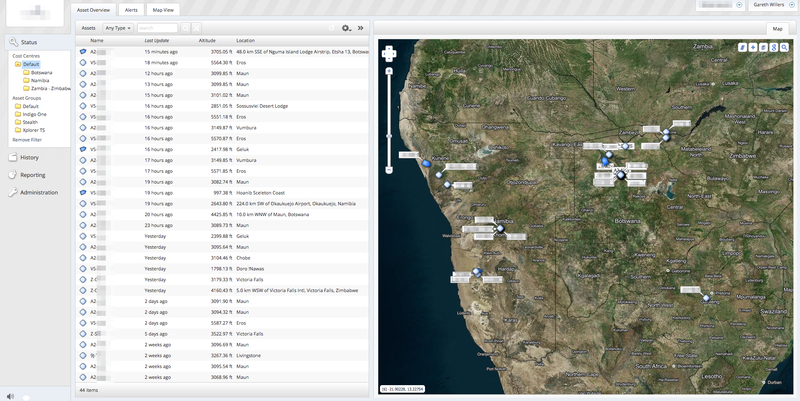 You can see the entire fleet, or select to view specific cost centres, or asset groups. Typically these are used for viewing aircraft in different regions of operation, or grouped by client, aircraft type etc. Clicking on the required Aircraft on either left or right panel, the system will zoom in to display the current position, along with a faded purple trail of the last 10 tracking points and the pop-up bubble with Local and GMT Date/Time reference, LON/LAT, Speed & Altitude.